At the heart of lighting performance is the lamp or light source. Lamps are the key determinant in the amount, quality, and distribution of light from a luminaire. Additionally, power consumption, maintenance and life cycle are lamp characteristics a facility owner will live with long after the initial purchase is made. T5 lamps are fluorescent lamps that are 5/8" of an inch in diameter. The "T" in lamp nomenclature represents the shape of the lamp-tubular. The number following the "T" usually represents the diameter of the lamp in eighths of an inch. T5 lamps have a diameter equal to 5 times an eighth of an inch, or 5/8". T5 lamps have a miniature bi-pin base while T8 and T12 lamps use a medium bi-pin base. T5 lamps are slightly shorter and therefore cannot be used as replacements for the larger lamps. Some luminaires, however, can be made to accept either T5 or T8 lamps by changing the sockets and ballasts. Induction Lamps feature 50% more energy saving thatn conventional HID lamps due to its luminous efficacy of 80lm/w. It only generates 1/3 heat comapred with conventional HIS lamps. With teh excellent colour rendering, it preserves the original colour of objects. It also has the advantage of instant start therefore no warm up required, and the wide range of operating temperature from-30℃ to +50℃. They can be extensively applied in Industrial, Commercial, Street, Outdoor and public lighting. Induction Ballasts features stable and reliable constant output current, excellent EMC and EMF design, and also the excellent power factor compensation design. It features the overload and overheat protection as well as the short circuit protection. This Induction Ballast also features long lifetime up to 60,000 operating hours guaranteed. It can be applied on the Cylinder Induction Lamp, Oval Induction Lamp and Spherical Induction Lamp. The NCON YES Box is a digital microprocessor-controlled power management system that is installed at the switchboard and is connected to a lighting circuit or multiple lighting circuits. Each unit, depending on the model used, has the capacity to handle up to 600 x 36 watt fluorescent tubes or the equivalent load of HID (Metal Halide, Mercury Vapour etc) lamps. Installation is a simple exercise that can be handled by our Velocity Electrical electricians. 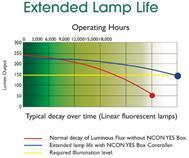 The NCON YES Box is designed to automatically manage the voltage level supplied to the lamps, within predefined limits, always "starting" lights at full nominal voltage supply and after a short start-up period (for fluoro's usually less than 30 seconds) maintaining the lighting, without discernible light loss, at a reduced voltage. Should extra banks be switched on, the YES Box "sensing" the change in demand, automatically switches to full power mode before subsequently reverting to economy mode. The Clipsal Energy Controller saves up to 30% of power used by fluorescent lights, with minimal impact on light levels, dramatically reducing energy consumption and power bills. The Clipsal Energy Controller pays for itself in approximately 1-2 years, based on average kWh energy costs. 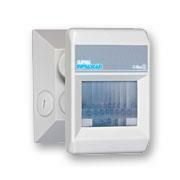 ​Motion & Presence Detectors are an investment that pays off over time - watt by watt, cent by cent, day after day. All the while significantly increasing the comfort and safety of the building. Suitable for use in residential and commercial situations for indoor and outdoor applications, Motion & Presence Detectors can be utilised to activate security lighting and HVAC systems. Motion & Presence Detectors can help to continuously adjust the output from dimmed lighting systems. This functionality provides greater improvement of energy management and cost benefits over traditionally switched systems, resulting in less greenhouse gas emissions and a better environment for us all. Created for the automatic control of lighting in both residential and private/public industry sectors. They automatically switch on lighting when movement is detected and turn off the circuit after the preset duration. Bringing comfort and enhanced security for exterior accesses to residential homes and garages, they also provide significant savings in lighting power consumption by illuminating only when necessary. Presence Detectors are ideal for controlling lightingin office spaces as they detect large movementsand also smaller finite movements, such as people working at a desk. When the area is left unoccupied, the lighting will be switched off, minimising the energy usage of the area. ​What can Velocity Electrical do for you? Velocity Electrical EcoSmart Electricians are able to provide you with the best options for energy efficiency outcomes. The knowledge and expertise we offer not only reduce the amount of electricity consumed but also the cost in both dollar terms and the benefits to our environment.